One hundred miles of trails cross through Becker and Hubbard counties, creating a combination of forest roads and township, county and state road rights-of-way. Passing through multiple state forests the trail rides through terrain ranging from rolling and hilly to level and smooth. 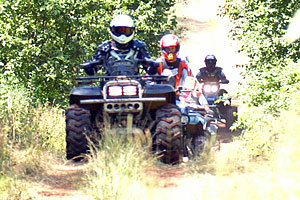 Trails are provided by Clover Township and maintained by the Forest Riders ATV Club. Co. Rd. 4. N. to Pine Lake Co. Forest Road, then 1/4 mile west. Second lot at Hwy. 200 and 4 intersection at Lake George Town Hall. Third lot at Flying W Gardens, Hwy. 71 and Little Mantrap Dr.